In my overenthusiasm for soup-making, I bought an awful lot of carrots with the intention of making carrot and coriander soup. However, also in my overenthusiasm for soup-making, I managed to break my blender so I needed to turn my hand to something that would work well when a little more rough and ready, though an emergency purchase of a hand blender has been a lifesaver. Keeping with the basic carrot and coriander theme, I remembered seeing Niamh's recipe over at Eat Like A Girl for a delicious-looking carrot and lentil soup, so I decided to try and create something similar. 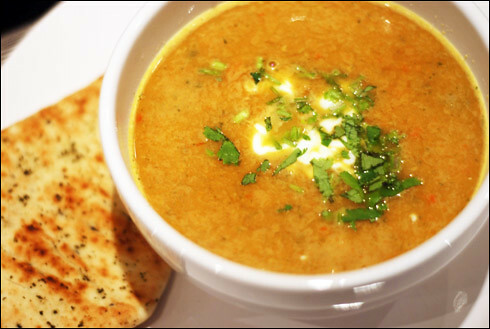 So here you have it - a delicious, gently warming carrot and lentil soup. To begin, rinse the lentils and then transfer to a pan and just cover them with water, then simmer for 15-20 minutes until they are soft. Keep an eye on them - if it looks like they are getting too dry, add a little more water. While the lentils are cooking, grate the carrots into a large bowl and set aside. Then, peel and finely chop an onion. In a large heavy-bottomed pan (I used a Le Creuset) toast the cumin and coriander powder for a minute, until it starts to smell. Then, add a little olive oil and gently fry the onion. Deseed and roughly chop the fresh chilli and add to the pan. Next, add the grated carrot, lentils, chilli flakes, lemon juice and vegetable stock. Simmer for 20-30 minutes, until the carrot is soft. While the soup is simmering, roughly chop the fresh coriander, then add the milk and most of the fresh coriander (reserve a little for garnish) to the soup and transfer, in batches to a blender and roughly blend it. To serve, ladle into bowls and then add a dessertspoon of yogurt to each bowl and a sprinkle of coriander. I served this with a small naan bread to complement the spicy flavours. I made this recipe for myself and my best friend today and it was absolutely delicious! So thanks a lot :D.